Learn the basic skills and techniques of kayaking on this 3-day kayaking course in Rishikesh. Your training begins on day 1 when an experienced kayaking instructor will guide you on the proper ways of handling the kayaking equipment. By day 3, you'll be paddling on the Ganges, making your way through white-water rapids rated grade I and II. Every day, you'll six hours learning how to kayak, while enjoying the breathtaking scenery of the mighty Ganges flowing across the mountains of Uttarakhand. Travellers are not required to have any prior experience in kayaking before booking this kayaking course in Rishikesh. The course has been designed to suit the needs of a beginner kayaker. This kayaking course takes you to the glacier-fed waters of the holy Ganges as it flows through the town of Rishikesh. As you learn the basic techniques like a wet exit or an Eskimo Roll, you'll be surrounded by sweeping views of the mountains and forests of Uttarakhand. Even as the rapids of the Ganga present an exciting adventure, spectacular views of the river twisting and turning across hills are sure to overwhelm you. • Learn kayaking in Rishikesh on a short 3-day itinerary. • Practice kayaking on the Ganges for six hours every day. • Learn kayaking in small groups with personalized attention. • Kayak over rapids rated grade I and II. Travellers are required to follow instructions of the kayaking instructor during the beginner's kayaking course in Rishikesh. Consumption of alcohol, drugs, tobacco products and cigarettes is prohibited during the kayaking sessions. For cancellations made more than 7 days before start date of the Rishikesh kayaking course for beginners: 95% refund. For cancellations made 2-7 days before start date of the Rishikesh kayaking course for beginners: 45% refund. For cancellations made less than 2 days before start date of the Rishikesh kayaking course for beginners: no refund. Prices displayed are per person prices based on a booking of three participants. If you're booking this course for less than three participants, a surcharge of INR 1,900 per person is applicable. The tour operator reserves the right to alter or cancel the itinerary of this trip due to bad weather conditions or other unforeseen circumstances to ensure maximum safety of travellers and staff. Travellers are required to bear any additional costs arising due to such a change in itinerary. The tour operator takes utmost care to ensure safety of the travellers and shall not be held responsible for any mishap, accident or loss of life during the beginner's kayaking course in Rishikesh. No pick-up for this Rishikesh kayaking course for beginners. 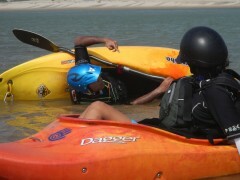 No drop-off for this Rishikesh kayaking course for beginners. Arrive at the tour operator's office in Tapovan, Rishikesh. Here, you'll meet your kayaking instructor and begin the day's training. Today, you'll begin with modules of theory designed to give you a basic understanding of kayaking. After the classroom session, you'll board a private vehicle and travel to a spot on the Ganges to begin practical exercises. Today, you'll start off on still water and learn about the proper ways of handling the kayaking equipment, different safety protocols to be maintained, techniques to use the paddle and ways to navigate the boat. You'll spend about six hours on the Ganges before the day's session ends by late afternoon. You can spend the rest of the day at leisure. Arrive at the tour operator's office in Tapovan, Rishikesh. Depending on your progress, your kayaking instructor will cover a few more basic techniques in kayaking such as a wet exit and Eskimo Roll. Once again, you'll travel to a spot on the Ganges and begin practical exercises. When you're comfortable with still water, you'll graduate to practicing on sections of the river where the currents have more flow and speed. You'll spend about six hours on the Ganges before the day's session ends by later afternoon. You can spend the rest of the day at leisure. Arrive at the tour operator's office in Tapovan, Rishikesh. Depending on your progress, your kayaking instructor will complete the theory section of your training. Once again, you'll travel to a spot on the Ganges and begin practical exercises. Today, you'll practice kayaking over rapids rated grade I and II, so you can experience your first white-water. You'll spend about six hours on the Ganges before the day's session ends by later afternoon. Your trip ends here. All equipment required for kayaking: safety jackets, paddles, kayaks etc. • Please carry specific personal or prescribed medication, personal first-aid kit for this trip. Rishikesh is well-connected to most major cities of the country via trains to Rishikesh railway station and flights to the Jolly Grant airport. The tour operator's office is located at Tapovan, 20-min drive away from the railway station and 40-min drive away from the airport. You may hire a private cab/taxi to reach the office.